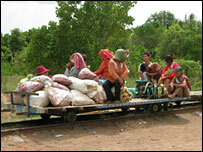 Travellers in Cambodia have to deal with one of the world's worst train networks. There is only one passenger service a week, and it often travels at not much more than walking pace. So people in the north west of the country, near Cambodia's second city of Battambang, have taken matters into their own hands. They have created their own rail service using little more than pieces of bamboo. The locals call the vehicles "noris", or "lorries", but overseas visitors know them as "bamboo trains". It would be a white-knuckle ride - if there were actually anything to hold on to. The bamboo trains reach about 40km/h (25mph), with the track just a couple of inches below the passengers. Warped and broken rails make for a bone-shaking journey. But the drivers insist it is a safe form of transport. 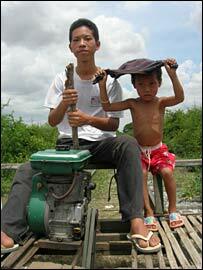 "We're very careful," said 18-year-old Sok Kimhor, a 10-year veteran of the bamboo trains. "We look out for children and animals running across the lines, and we have to slow down when other trains come along." Low fares add to the appeal, but the service is not without its quirks. There is only one track - so if two trains meet, the one with the lightest load has to be taken off the rails so the other can pass. The bamboo trains have been an unofficial part of the Cambodian transport network for years. The official railways survived decades of civil war and sabotage by the Khmer Rouge, but all those years without maintenance have taken their toll. Recent cuts to the timetable mean the official service to Phnom Penh now departs just once a week, and local people are left little alternative but to use the bamboo trains. "I use the bamboo trains to go to Battambang from my house in Phnom Teppedey so I can buy medicine," said Sao Nao as she sits on the rails with a small group of people, waiting for a nori to depart. "They're very safe - a motorbike taxi is too fast, and if I use one of those I sometimes get dizzy and fall off. On a bamboo train I can sit down and go to sleep. You can't do that on a motorbike." Motorbikes would also struggle to take the loads that bamboo trains happily lug - indeed they often form part of the cargo, alongside freshly-harvested lychees, machine parts and timber for building houses. While there is plenty of bustle around the bamboo trains at their improvised stations outside Battambang, the city's main station lies deserted. Cattle chomp on the grass growing over the rails and children play on the tracks without any fear for their safety. In Phnom Penh, the story is much the same. The station is beautiful, but three battered carriages are all that is left of Cambodia's passenger rolling stock. 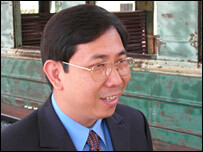 The director of Cambodian Railways, Sokhom Pheakavanmony, admitted that passenger services are currently woeful, but said that improvements were on their way. "In a plan under discussion with the Asian Development Bank right now, by 2010 we will be able to complete the rehabilitation," he said. "I think that if the rail condition is good, the passenger trains can run. I hope that in the future, people can use the trains to move from one area to another area, and from one country to another." The ultimate goal is for Cambodia to be a key part of a railway linking all of South East Asia, but that seems a long way off to the people of Battambang. Despite official efforts to discourage the service, they will keep the faith with the bamboo railway until they see concrete proof otherwise.